In this study, we evaluated the antibacterial activity of toothpaste with Propolis, used for the treatment of teeth and as a medicine for endodontic treatment. Toothpaste with Propolis was prepared using the water-soluble Propolis extract. Calcium Hydroxide was a control, as well as two commercial and two medical toothpastes. The bacteria on which Propolis toothpaste works are Streptococcus mutans, Staphylococcus aureus, Micrococcus luteus, Escherichia coli, Pseudomonas aeruginosa and yeast Candida albicans. The inhibition of bacterial/yeast growth was evaluated by colouring with resazurine. The inhibition of bacterial/yeast growth is apparent in changing the color of resazurine from blue to pink. MIC (Minimum Inhibitory Concentration) was determined as the maximum dilution in which no minimal color change occurs or a minimal color change occurs. For example, in the seventh hole, the color from pink to blue has changed. Therefore, the color change in the seventh hole at dilution 1:64 means MIC = 1 × 10/64 = 0.156 mg/mL. MIC values ​​of toothpaste with Propolis were against S. aureus: 0.031 mg/mL (0.326 mg/mL of medical toothpaste, 0.187 mg/mL of commercial toothpaste); Micrococcus luteus: 0.003 mg/mL (0.140 mg/mL of medicinal toothpaste, 0.046 mg/mL of commercial toothpaste); Streptococcus mutans: 0.015 mg/mL (0.140 mg/mL medical toothpaste, 0.019 mg/mL of commercial toothpaste); E. coli: 0.015 mg/mL (0.375 mg/mL medical toothpaste, 0.062 mg/mL of commercial toothpaste); Pseudomonas ae ruginosa: 0.062 mg/mL (0.281 mg/mL medical toothpaste, 0.046 mg/mL of commercial toothpaste) and yeast Candida albicans: 0.015 mg/mL (0.140 mg/mL medical toothpaste, 0.281 mg/mL commercial toothpaste ). Comparison of MIC values ​​between toothpaste with Propolis and medical toothpastes demonstrates greater effectiveness of Propolis toothpaste from 4.53 to 25.0 times. For St. aureus, this was 10.51 times; for Str. mutans 9.33 times, E. coli 25.0 times; for Pseudomonas aeruginosa 4.53 times and yeast Candida albicans 9.33 times. Compared with commercial toothpastes, Propolis toothpaste was better: 0.74 to 18.73 times. For St. aureus, was 6.03 times, for Str. mutans 1.26 times, for E. coli 4.13 times; for Pseudomonas aeruginosa 0.74 times and yeast Candida albicans 18.73 times. ISNAD RIHAR, Klemen , EXEL, Dunja Gregorič , PEREYRA, Adriana , KOPINČ, Rok , FILIPIČ, Bratko . "Toothpaste with Propolis “Apident” Shows Antimicrobial Activity in vitro". 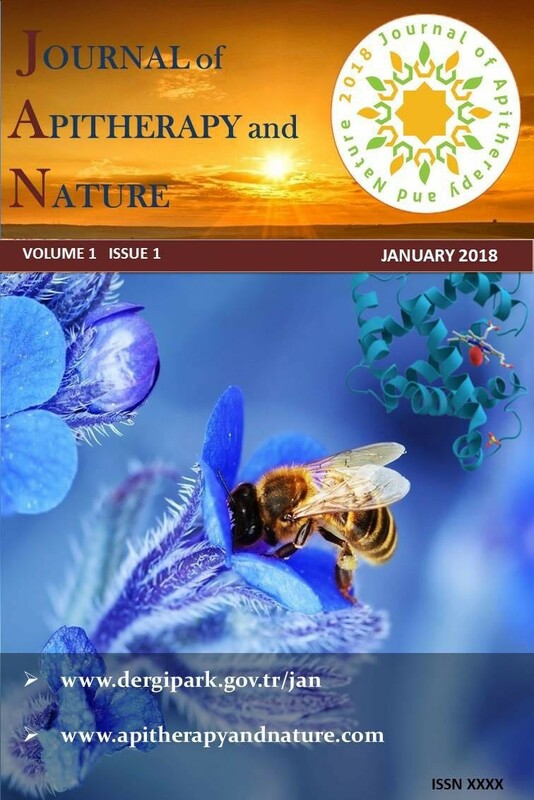 Journal of Apitherapy and Nature 1 / 3 (December 2018): 31-31.